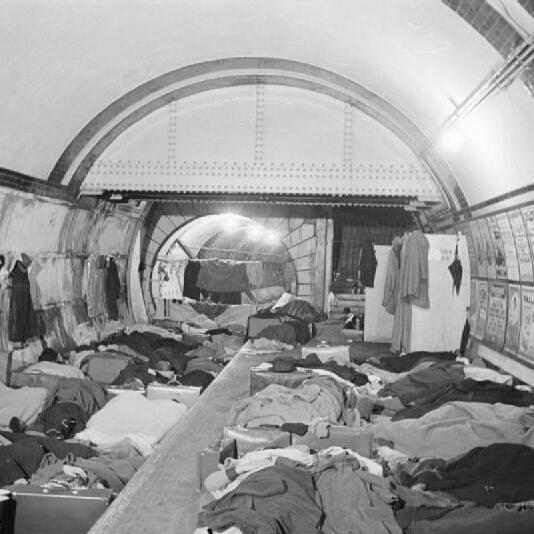 People sheltering from air raids line the platform and tracks at Aldwych Underground Station in London. A row of coats can be seen hanging on the wall. This photograph was scanned and released by the Imperial War Museum on the IWM Non Commercial Licence. The image was catalogued by the IWM as created for the Ministry of Information, which was dissolved in 1946. Consequently the image and faithful reproductions are considered Crown Copyright, now expired as the photograph was taken prior to 1 June 1957.